This is a short film with highlights from the voyage. For the daily blog entries please scroll down. The final preparations have been made, the food is stowed and the crew are ready. After three fabulous Harbour Sails the STV Lady Nelson has departed for a week of adventure, sailing, fun and, if we can find the time, a little training. 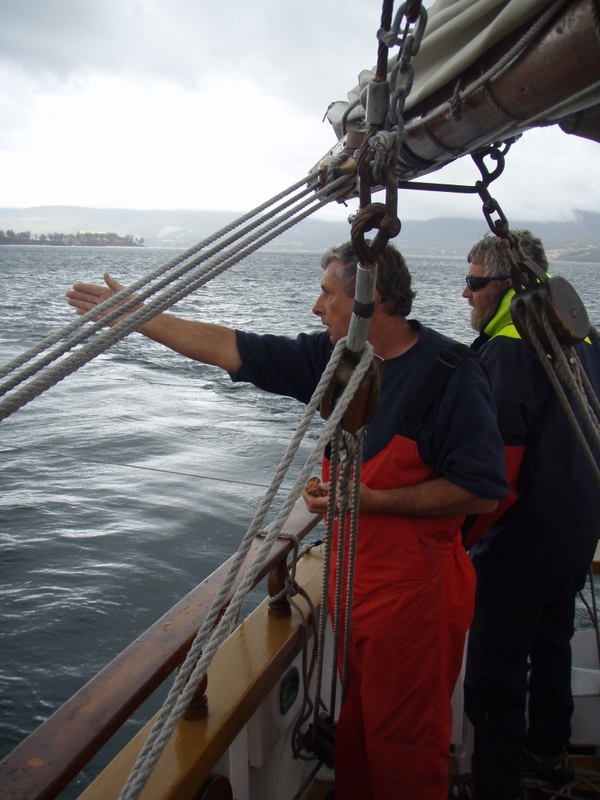 The wind was from the South East, which means that we were unable to sail out of the River Derwent. Hopefully tomorrow the wind will be more favourable. Because of their crushing defeat the Buckaneers were allowed to have first go at dinner. 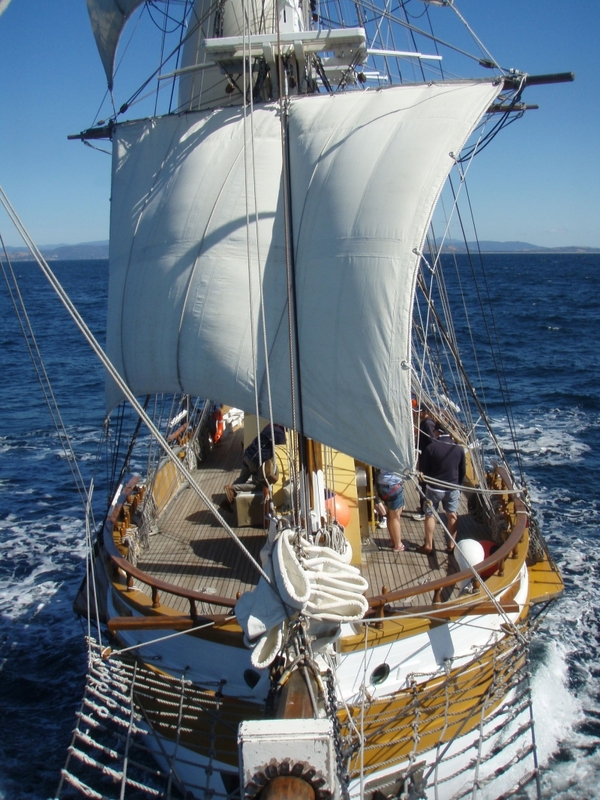 But, this was a mixed blessing; the vessel was rocking and rolling in the 1-2 m seas. By the time Ed's watch went to eat we had entered the D'Entrecasteaux Channel and the table remained resoloutly horizontal throughout the meal. We have anchored for the night in Oyster Cove. Note, these do not include the Harbour Sails. Hi everyone Mal here. Just thought that I would compliment the crew on their achievements today. There is a bit of a buzz on board with many helping others so that they can achieve their competencies. 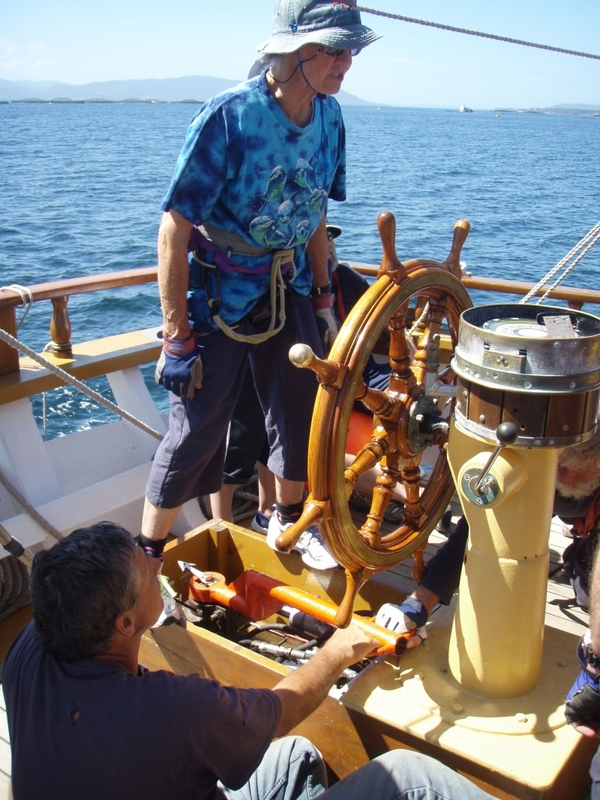 Looking around the vessel you see crew mentoring for steering, knots and even the sextants and compasses were given a run. 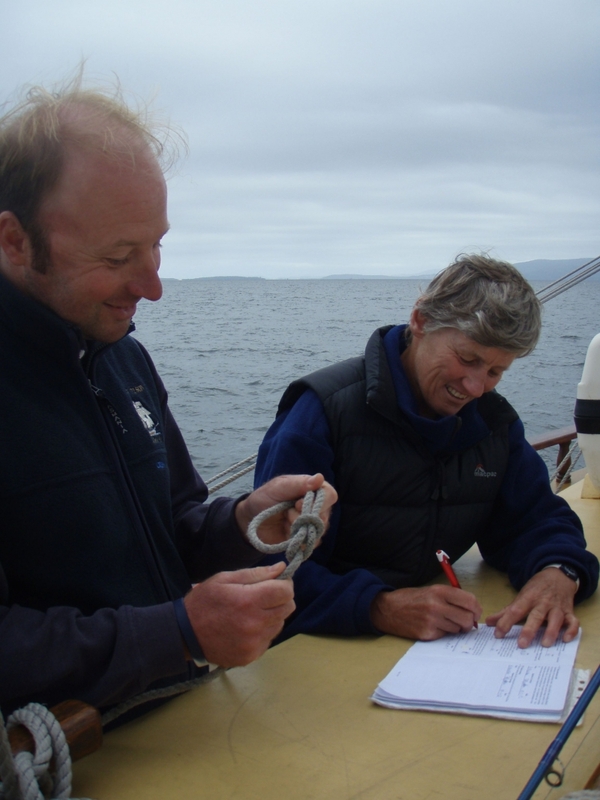 We have had 32 competencies signed off today and that is not including the new competency of unhooking a giant cable or rope that was picked up with the anchor. Kurt an Meg are feeding us in the usual LN high standard. All is well, especially if the anchor holds this time. Great effort all round. After all of the anchoring dramas, dragging and hooking cables, we eventually found a secure anchorage and remained snugly in place for the rest of the night. Another early morning saw us running South-South-East across Storm Bay at a brisk 5.8 knots. 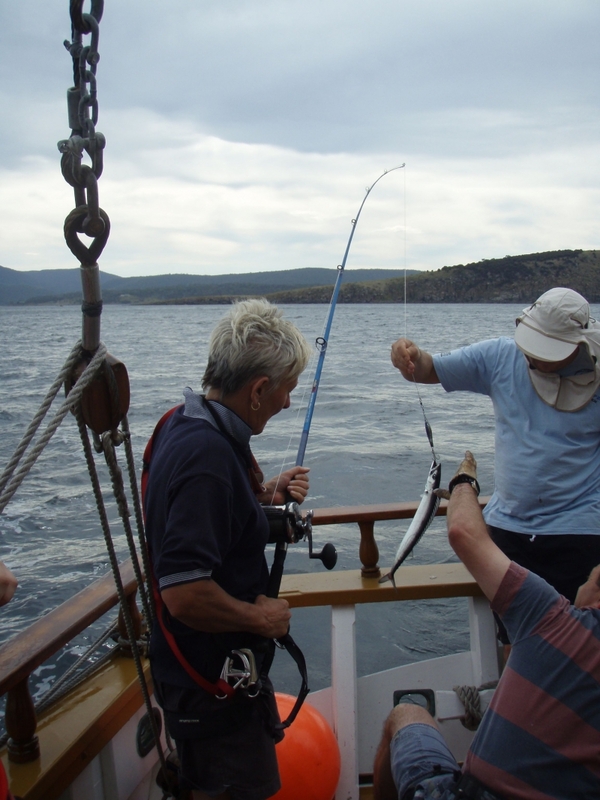 Just off wedge island we passed a vessel hauling in barracuda and promptly set about catching our own. After some frenzied activity fourteen were landed and passed into the safe hands of Kurt, who promptly cleaned each of them. After 20 NM the North-Easterly faded away and we were left with the stark reality of a long motor to a safe anchorage before a strong South-Westerly came through. 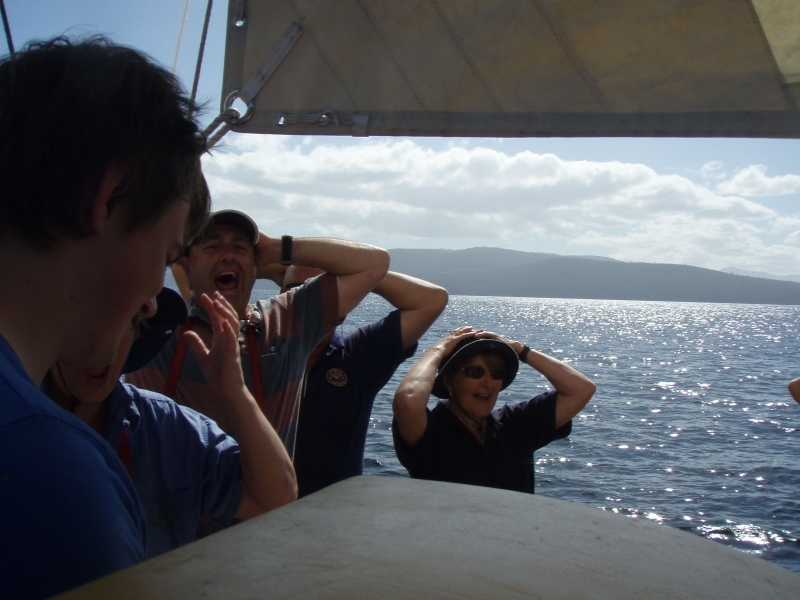 While making way towards Alexander's Bay on Bruny Island the crew competed in another brutal test of body and spirit. 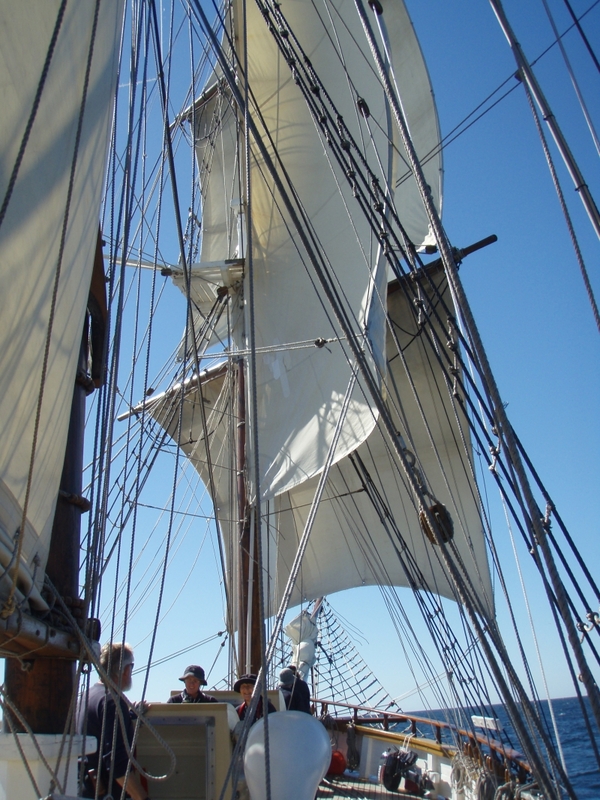 Each watch was assigned to one side of the vessel while the Master called setting and handing each of the three Foremast square sails. During this the watchleaders and training officer were casting a critical eye over proceedings. Several small deficiencies were noted for each watch, but the judges were unable to split them. 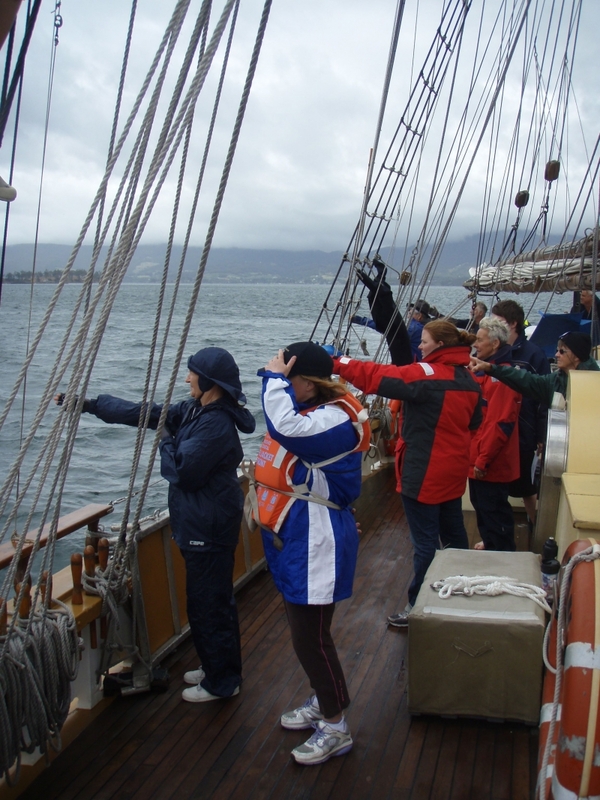 A victory was declared for sail training and we continued towards Alexander's Bay. By the end of the day a further 23 competencies had been signed off. What a day we all have had. Weather so changeable. 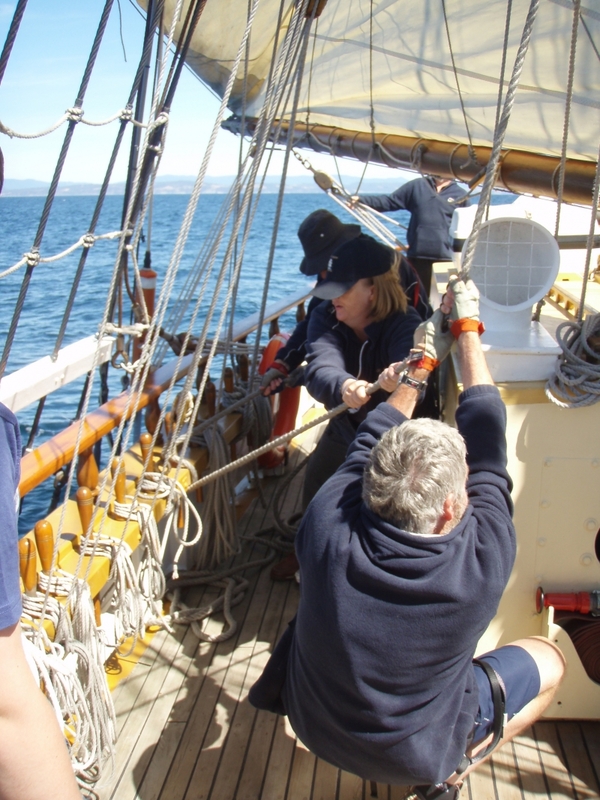 We have all trained on tacking and were pushed to the limits of our teamwork ability, and we all improved. Even our cooks said they were green, but they smiled through it all and did a very good job. At the moment we are relaxing and it feels so good. This day has been so full; learning how to catch the wind, even the fire alarm made an appearance. This was not a planned training, but helped to bring us together as a team. 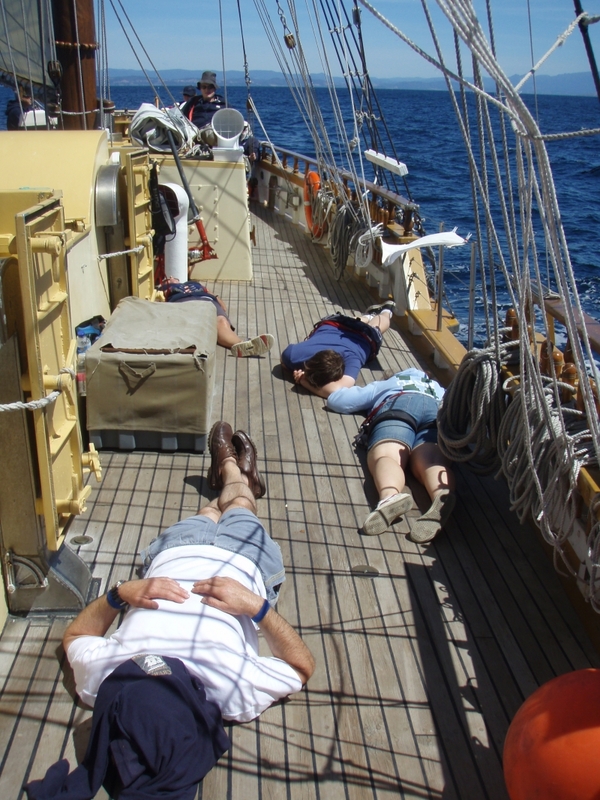 Last night we even had a crew member sleep soundly on the deck. This training has been amazing so many of this crew have had their competencies signed. There is with all this action a real warmth amongst the crew. The desire of things to achieve; all have done what they wanted to achieve and the weather has been so very changeable. Another great trip. For this day, with fresh fish, 10/10.Thanks. Sunday after the Harbour Sail the first leg set off on an off-shore training. We were meant to go to Swansea, but the Skipper decided that the weather was too rough. I managed to get one of my competencies marked off. It was also my first trip away without Josh; we normally do everything together when it comes to the Lady. All up I did enjoy the trip – even though we didn't go to Swansea. We had a snorer in the midship cabin, which kept me and others awake. 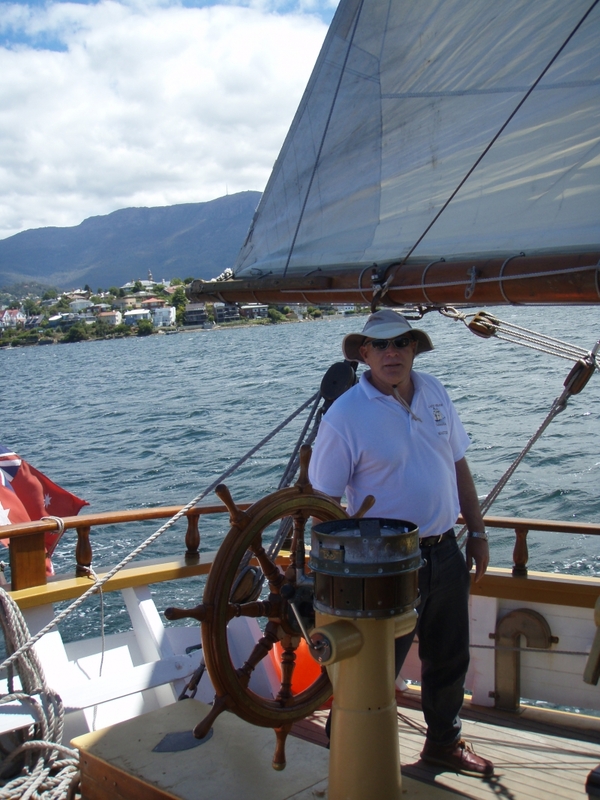 My first aim is to get all of my Deckhand competencies marked off by next year so that I can do the Tall Ships race from Sydney to Hobart. The fire alarm went off today (Tuesday 17th). 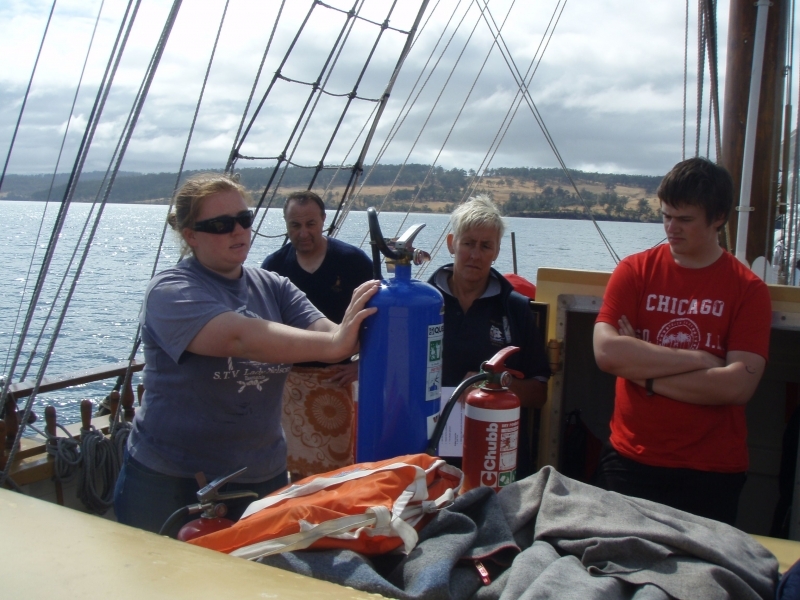 The halfway day began with safety drills; fire and man overboard. During the final moments of the discussion about man overboard procedures one our cooks, Kurt, leapt from the vessel into Alexander's Bay. Kurt, who was suitably kitted out with a wetsuit, flailed in the water and was “unable” to grab hold of the life rings thrown in his direction. Eventually a heaving line was cast across his outstretched arms and he was pulled to safety with the man-overboard strop. The exercise provided a valuable insight into how quickly actions need to be taken in real emergency situations. After appropriate first aid had been applied Kurt was deemed fit and healthy. He promptly leapt back into the water to help demonstrate rescue procedures from the STV Lady Nelson's new tender. 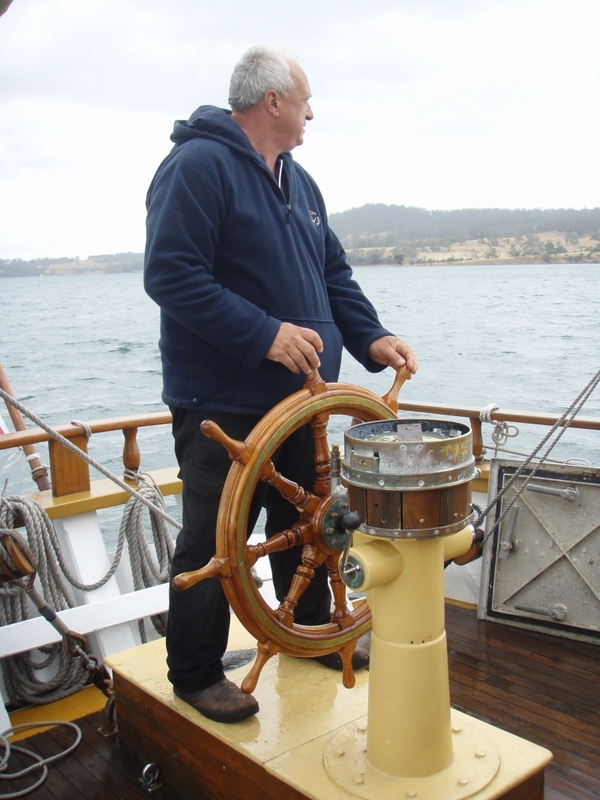 While motoring over to Kettering, Brenton was placed in charge of the vessel, and Dan in charge of the deck, to retrieve our man-overboard buoy, affectionately known as Bob. After successfully retrieving Bob not once, but twice, we continued to our rendezvous. Two members departed, John and Melissa, but two new faces have joined our crew. A hearty welcome to Gill and Josh. 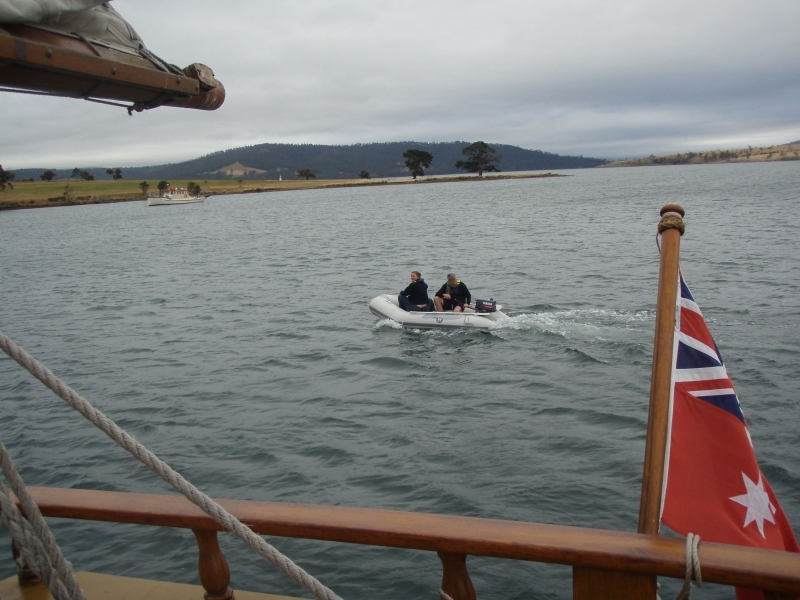 We then continued South down the D'Entrecasteaux channel and set sail off Satellite Island. 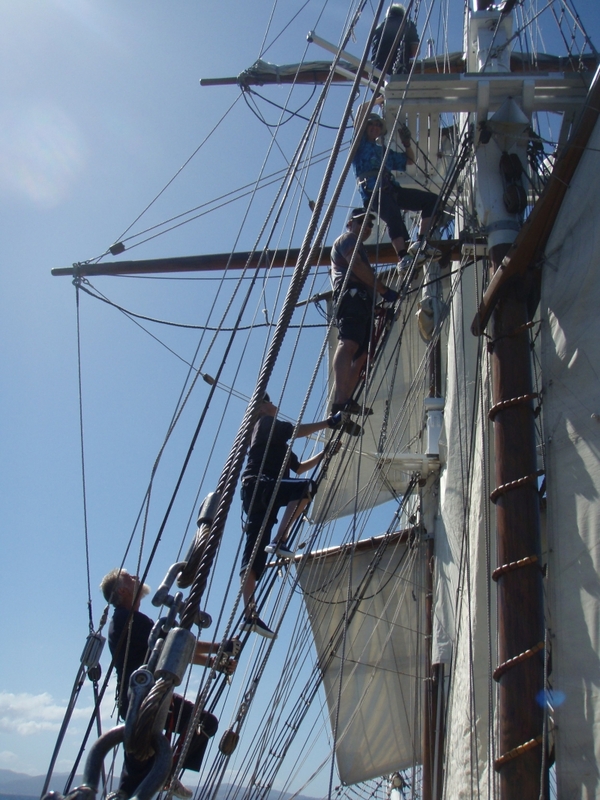 The crew were now united in our goal of making ground to windward under sail. Our first two tacks resulted in no ground gained to windward, but after that we managed to gain nearly one nautical mile over a 2.5 NM tack. All in all we covered just over five nautical miles and made one to windward. A fantastic effort by everyone. 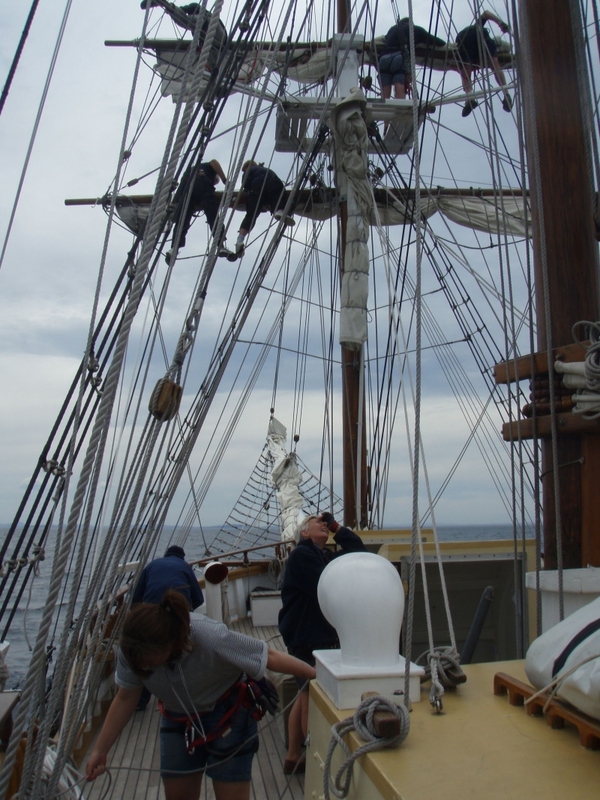 Many of the experienced helmsmen aboard were delighted to feel how balanced the ship was with all of the fore-and-aft sails set. 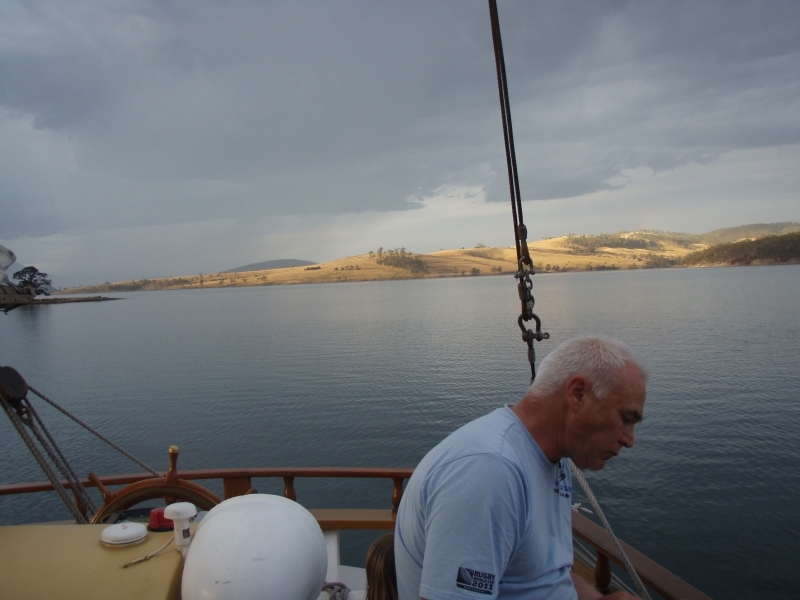 We have anchored for the evening in the Quarries on the southern half of Bruny Island. 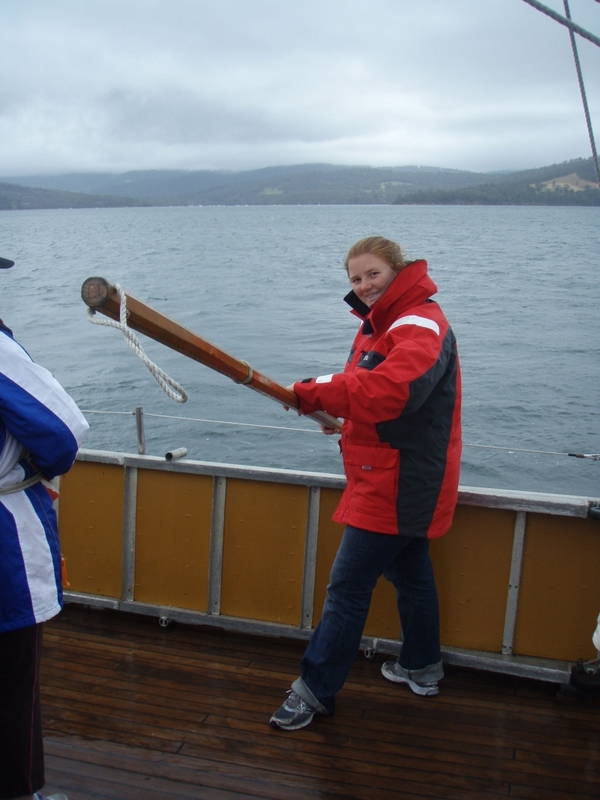 It was the morning of Thursday the 19th of January 2012 and The Lady Nelson was at anchor in Little Tailors Bay on the southern end of Bruny Island. The bay was nestled in and around the rolling hills of the Channel. It seemed to be a world away from life ashore. There were only a few white clouds speckled around the horizon of the brilliant blue sky. The sun was out and bright as anything. The ship was barely moving on the anchor cable, as there was no wind. The water was like glass. Breakfast was finished, the rubber ducky was inflated, fishing lines were brought up on deck and the morning activities were commenced. The dingy was lowered into the water and took a few swimmers over to the point for snorkelling/ diving. Another few went ashore for a walk and exploration. 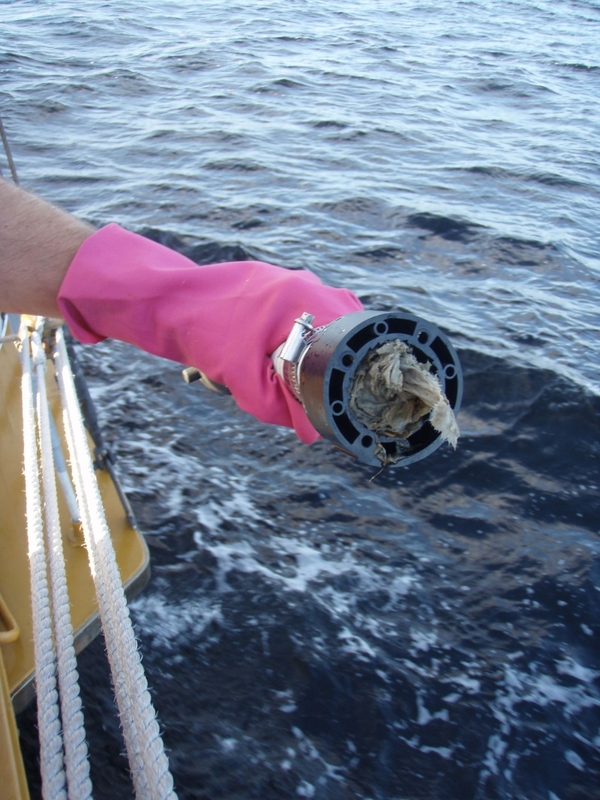 While on board there was music coming from the poop and the fisherman were getting nibbles. All of a sudden the sun-bakers where awoken from their semi-conscious state by the yells of “Bucket! Bucket!! I need a bucket!! Someone get me a bucket! !” The Capitan had caught a small ray. There was a great rush of energy with much interest, photos were taken and the sun-baking was re-commenced. The fishing was enjoyable by all opinion. Though we didn't catch any to eat, what was caught was thoroughly interesting. Two octopus, a few flat-head, a cod, a ray, the back stay and the rubber ducky. Through the tranquil setting came the noises of laughter and frivolity from across the water. The rubber ducky was on it's way back from shore with a couple of swimmers who where cold and yet full of cheek. 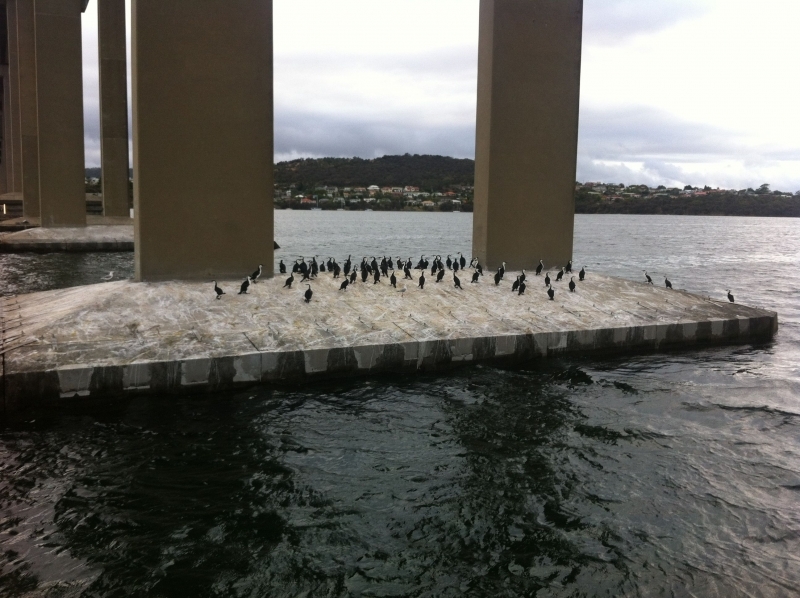 They had just experienced a very enjoyable swim of the point. They found, swimming through the sea dappled sea weed, fish to investigate, while searching for abalone, crayfish and other delectables. In the end they were a lot more successful than the fisherman on board. Along with the dozen muscles an abalone had also been caught off the point. It was the perfect opportunity for some dingy training while the boat was out on the water. They had a run ashore and found some oysters to devour. They got to practice coming up alongside the vessel, up on the shore and general operations of the duck. The patch on the hull, from the previous days adventures held and was a success. 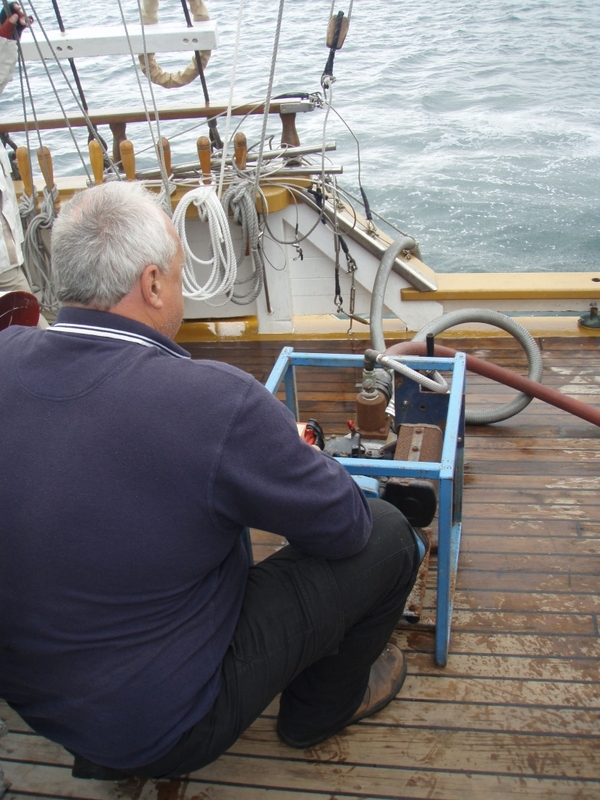 After the engineer and his assistants had finished working on the pumps they got to come up from the bowls and enjoy the relaxing morning on board. About mid day we picked up the pick and headed further down the channel for some wind. We didn't find the wind, but we did find the swell. Which then managed to knock out a couple of the crew down to their bunks for a while. We headed up north and did an emergency steering drill. During the drill we covered 1.44 nautical miles (NM). 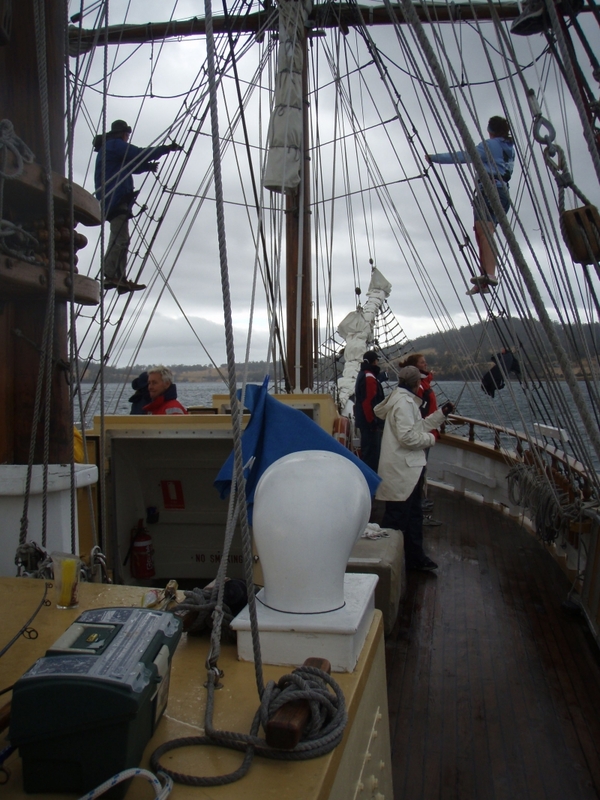 Shortly after the drill, we commenced the setting of all 12 sails!! It was brilliant to have them all up and have the crew learning and working together the whole time. It was a fantastic feeling to be a part of it. 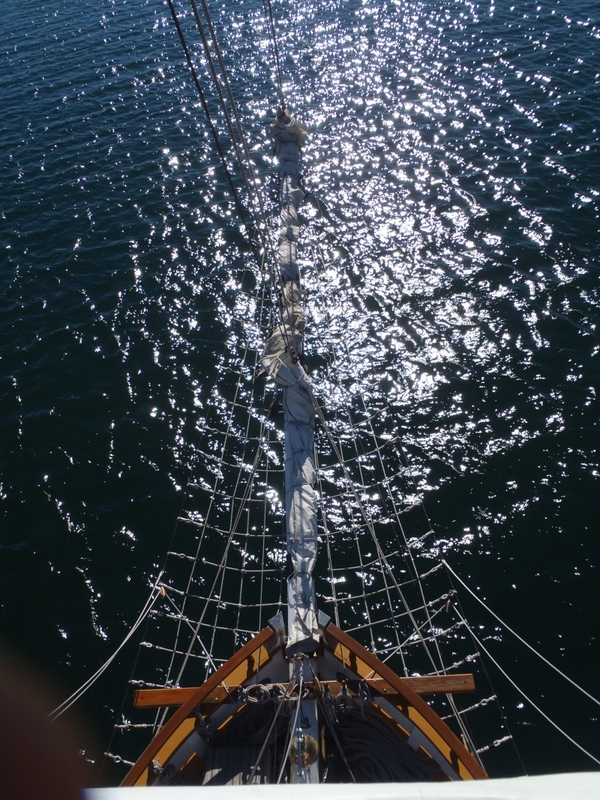 I love being at sea and under sail, listening to the gentle creek of the rigging as the ship rolls from side to side and the rig follows. 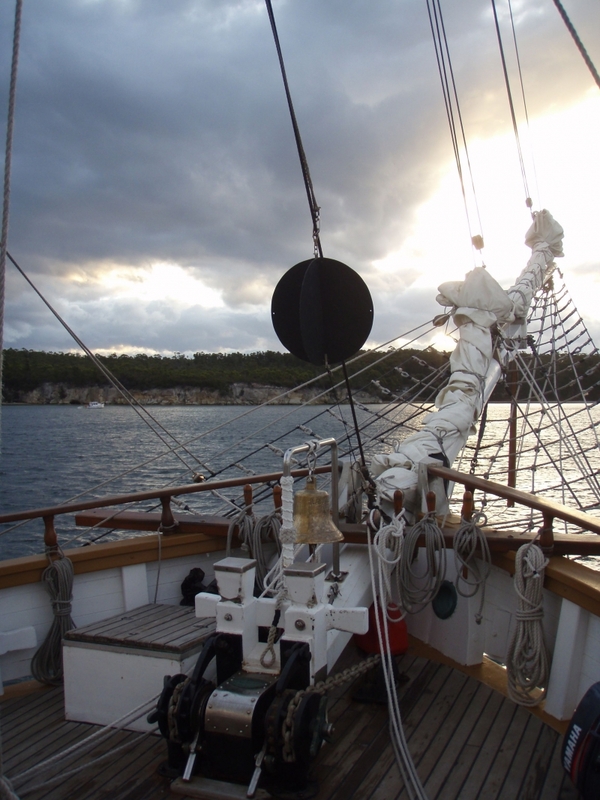 The lapping of the sea against the hull and the general chatter and laughter of the crew creates such a warm feeling. The conversations ranged from technical talk about rules of the road, sail operations, fishing techniques to the technique of dunking ginger nut biscuits in tea so they don't fall apart. Though unfortunately, the wind then died and we had to put them down. It seemed like only a minute after, the wind then decided to come back as a strong and steady easterly, so we had 4 sails up and sailed to our anchorage. 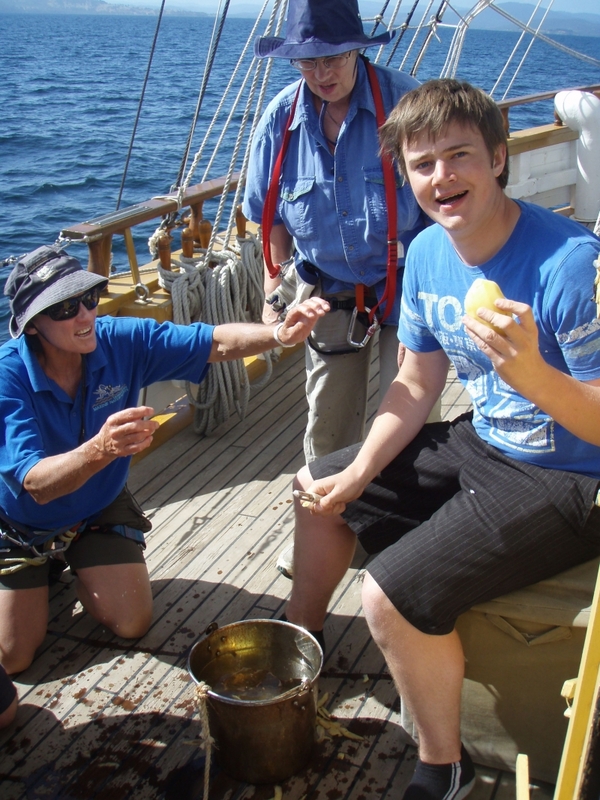 During the sailing we had a potato peeling competition between the red team and the green team. My team, the red team, won!! OH YEAH!! I got to bring the ship into anchorage for the first time, which was great!! 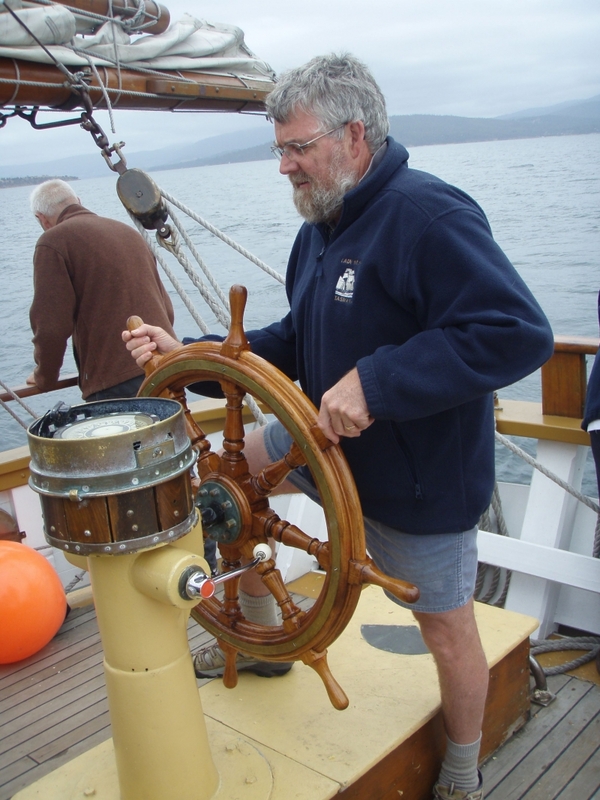 My father was on the helm and the old man (captain) was keeping a close eye. It was a real buzz for me. Dinner was brilliant with a fine apple crumble made with ships biscuits!! A wonderful day of fun, sail and friends!! Friday morning found us in the same location we had been all night; at anchor in Copper Alley Bay, a stone's throw from Shag Point. Unfortunately there was no wind and the forecasts were predicting that the only wind all day would be a sea breeze. 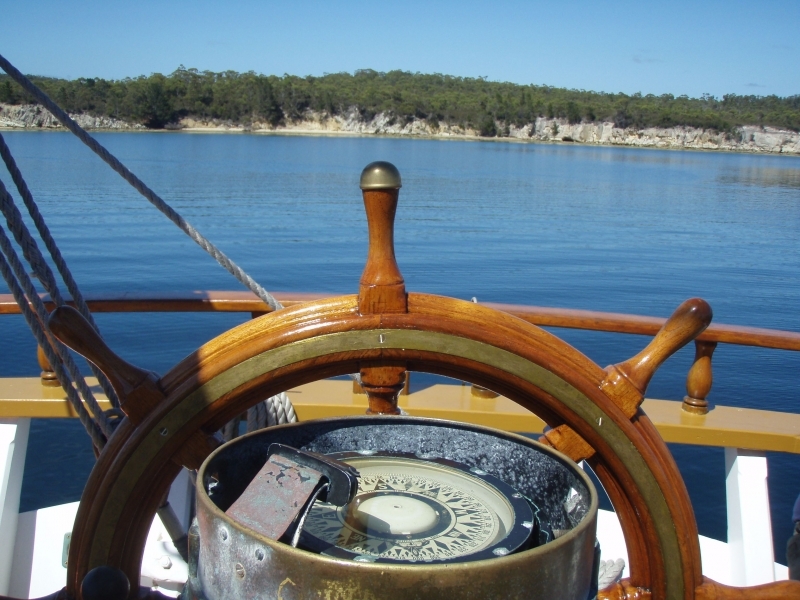 To maximise sailing opportunities we quickly weighed anchor and planned to reach the Northern end of the D'Entrecasteaux Channel just after midday. Many of the crew used this time to undertake further training. 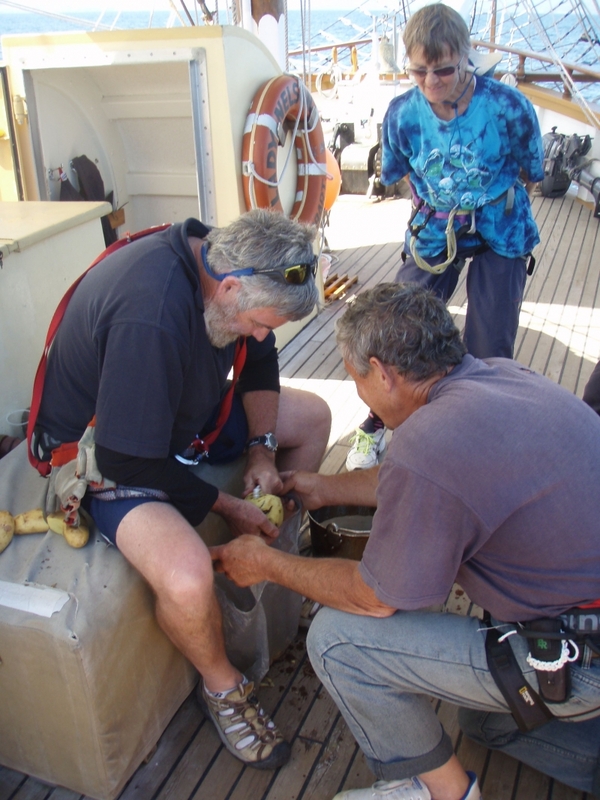 A highlight was Josh successfully demonstrating each of the knots required for his final deckhand competency. 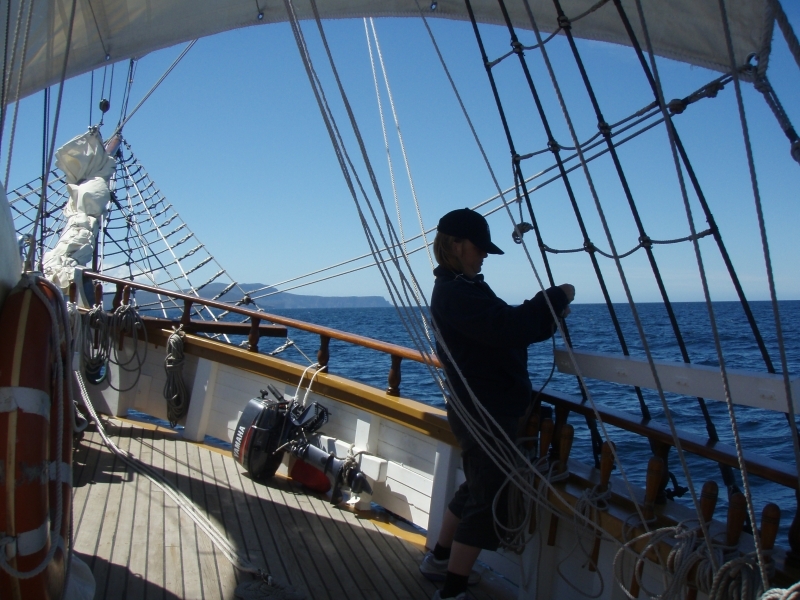 After some final paperwork Josh will be a certified Deckhand aboard the STV Lady Nelson. The smooth waters meant that some final rubber ducky training could be undertaken. The tender was launched while the vessel was making way, another first, and after reassurances that the tender could “easily go much faster than the Lady” two crew members were off. Unfortunately the promised speed failed to materialise and the tender was soon seen dropping astern. At about this time one of the non-slip mats used when serving food was accidentally dropped over board. This quickly became a man-overboard drill. 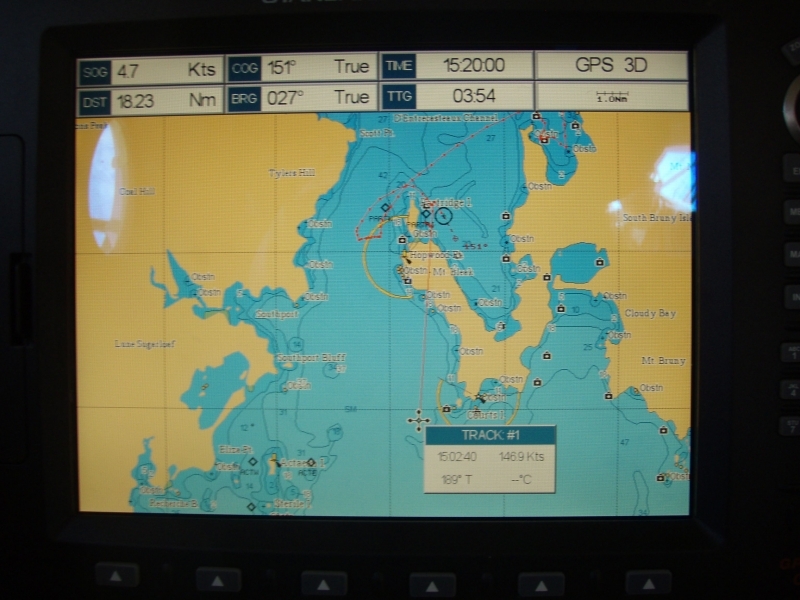 Once the matting and the tender had been recovered we continued towards Dennes Point for a final attempt at catching squid. 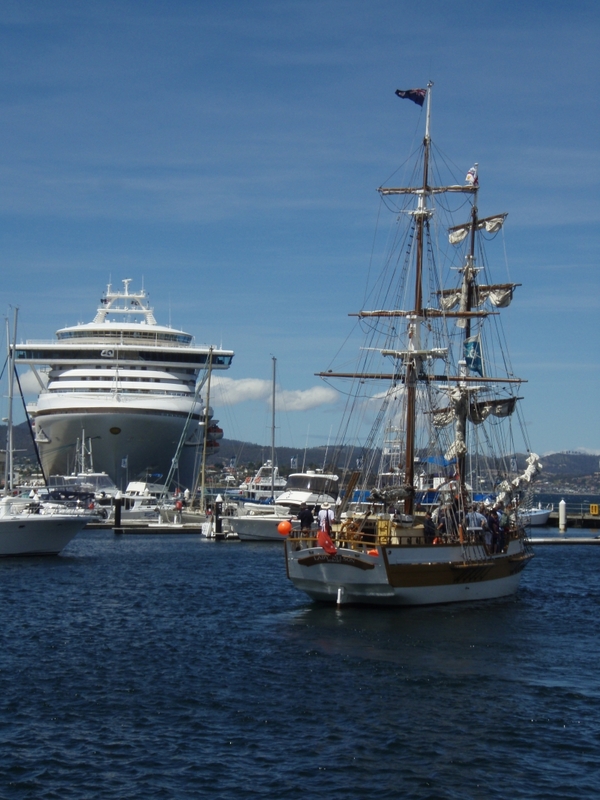 By this time, the promised sea breeze had materialised, unlike the rubber ducky's turn of speed, and we set our sails for Hobart. 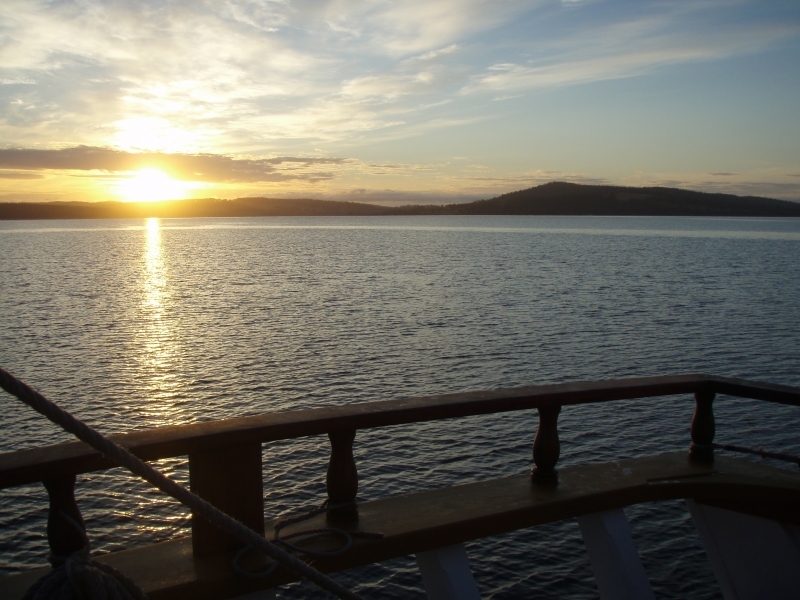 The final night of the voyage was spent at anchor in Cornelian Bay. Watchleader Brenton was given command of anchoring the vessel and ordered 50 m of cable to used; the longest length of cable for anchoring during the entire voage. 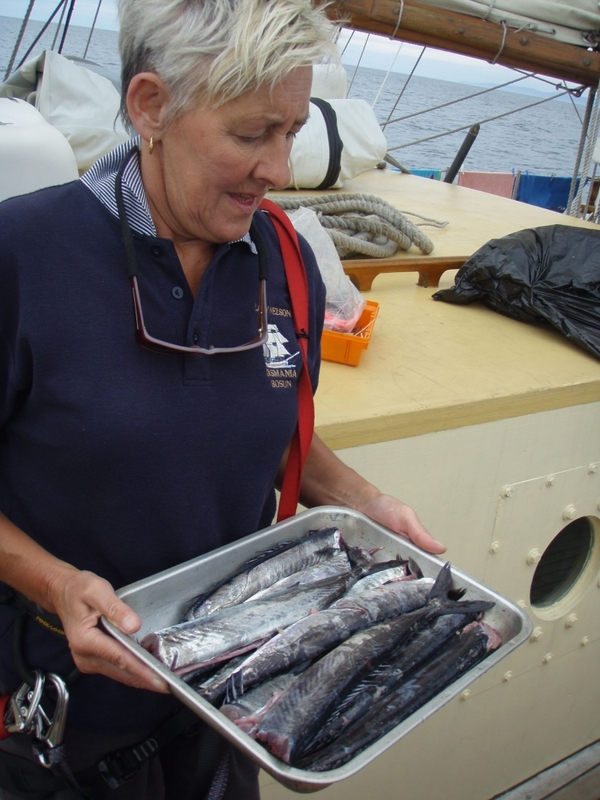 Prizes for various exploits were awarded; seafood nibbles made from mussels, abalone and barracuda caught earlier in the day were served with pre-dinner drinks; and many of the crew stayed up late into the evening savouring an exceptional voyage. It's amazing what one can achieve on a week long training trip. 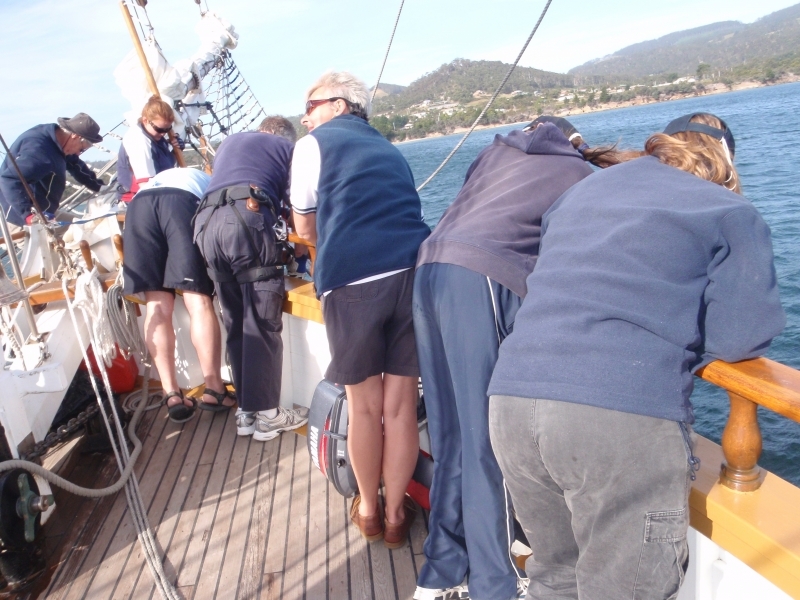 Our intrepid travellers have worked exceptionally well, pushing their sailing skills and knowledge forward. To date, the final morning before heading back to port, our total number of signed off competencies is a staggering 144. This is a fantastic effort and all are to be congratulated – a truly wonderful result!! This trip has been a tremendous success and stretched everyone onboard on many levels. I am sure that there will be no-one that leaves our dear Lady without having gained a wealth of knowledge, improved sailing skills and a grand feeling of team spirit and a huge sense of satisfaction in a job well done!! We all hope to see trips like this one repeated in the future as part of a permanent program. Quite clearly the results in competencies gained speak volumes in support of such an endeavour. Our congratulations go to all those who took part, organised and so willingly made the most of this training week. Our trip all but finished last night. 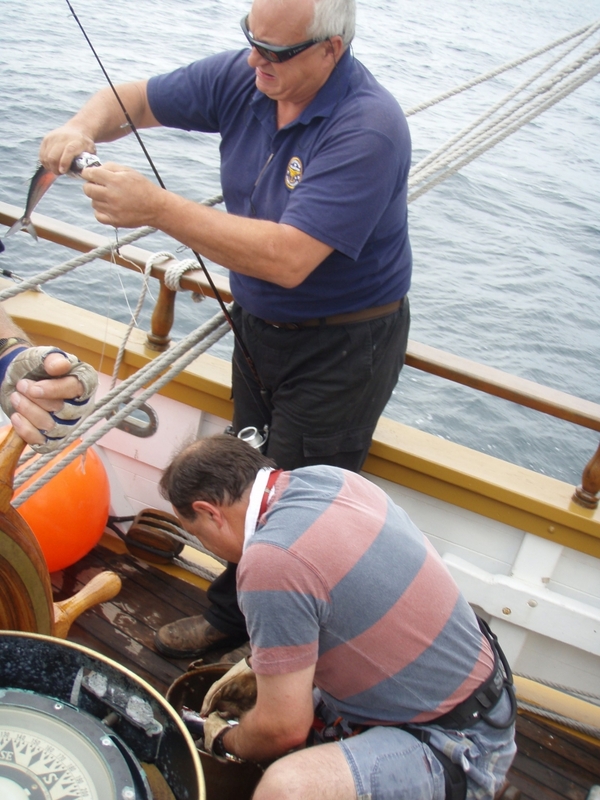 All that remained to do today was motor back to the wharf and clean the ship, and ourselves, in preparation for the day's three Harbour Sails. 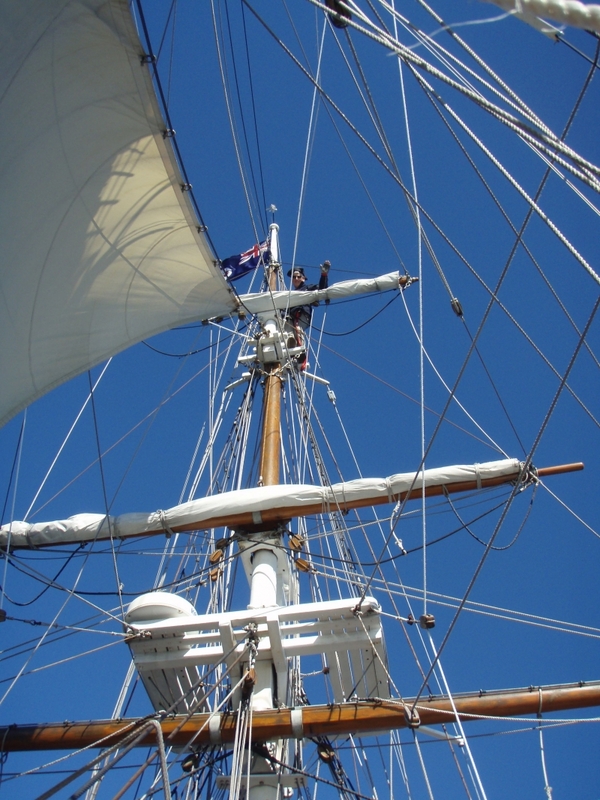 The crew all stayed to help with these sails and we surprised the Purser who had joined us for the Harbour Sails by casually tacking on the River Derwent. He recovered very quickly and told the passengers that it was quite unusual and difficult for the STV Lady Nelson to tack. The well trained crew then promptly tacked again. Unfortunately the third Harbour Sail was cancelled due to strong winds. It is true what they say, “You get out what you put in” and by my state of mind and body at the completion of this trip, there is not much more I could expect to receive. My body creaking in every joint, well done sun tan and my mind awash with new information which I expect will take a month of dreaming to sort out. 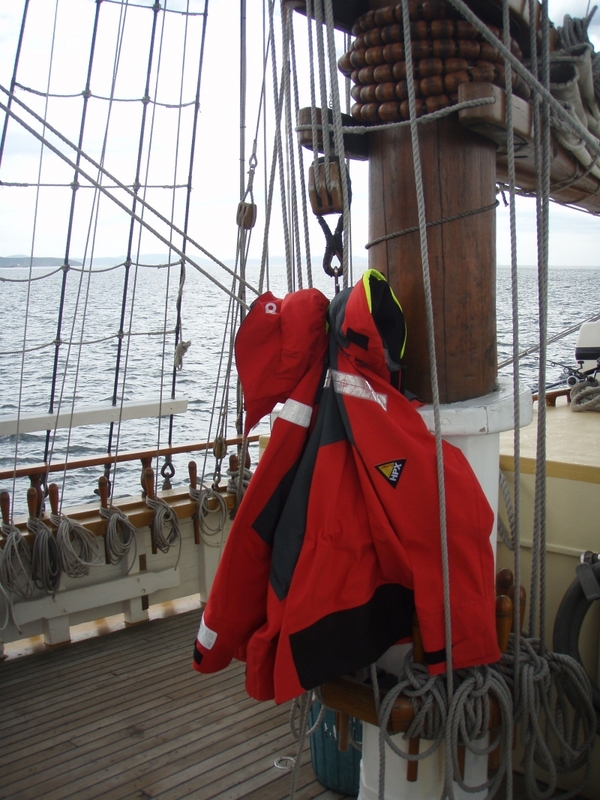 For me it was an opportunity to learn and absorb things not possible during harbour sails and to demonstrate the abilities I do have; until now laying dormant and unused. 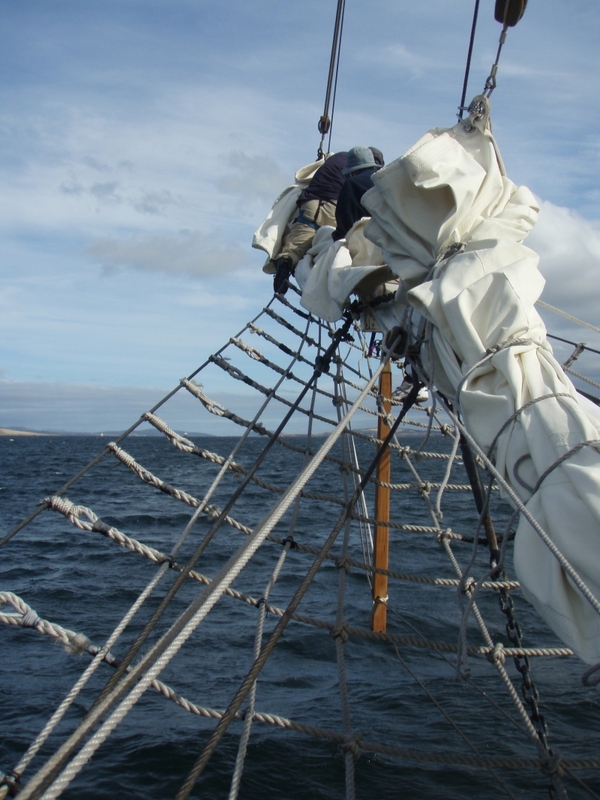 Having to travel so far to participate sailing on the Lady Nelson, it was wonderful to gain so much time in one go rather than just two part days over a weekend. Also it gave “me” time where I could actively investigate and learn things without neglecting my contribution and responsibility as exists during tourist trips. Highlights would be, playing with the ships plumbing, free form ship handling by stemming the tide and wind during crew change over, and of course a go at command while anchoring. 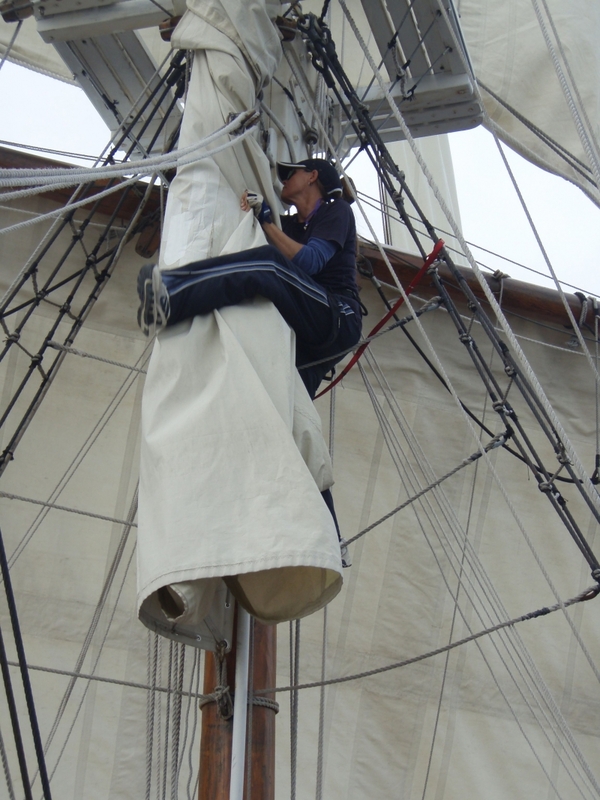 Playing Bosun during tacking manoeuvres was an experience in itself. I am sure those who would say, “I would not make a Bosun’s backside”, would now agree I would! 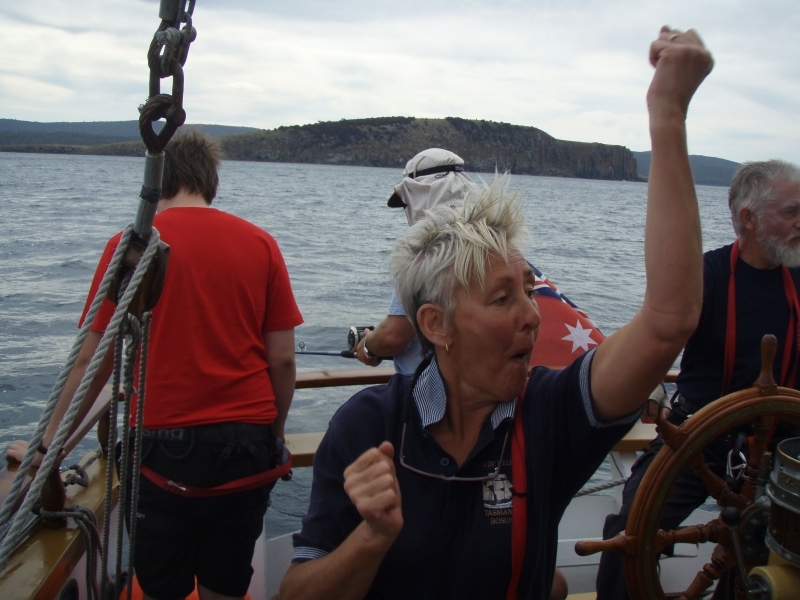 Perhaps we should consider entering the |Lady Nelson in the Sydney to Hobart next year as Mal certainly has a knack for making her perform. Of course the opportunities to share comradeship though mentoring and the trip’s experiences rates most highly. The Apple Crumble made by Meg rates top on the food list. 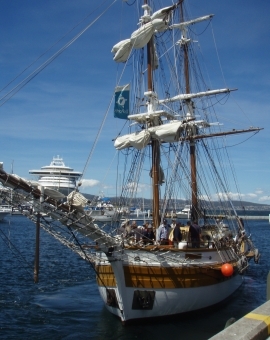 From the outset the experience seemed like a dream, the small ship beside the wharf at Elizabeth Street Pier is a wooden replica of the original little inshore exploration brig of 60 feet length. In 1800 she successfully arrived in Sydney despite the near impossibility of sailing from England to the colony so heavily laden with cannonade she only had 2 ft. 9 in freeboard. Adventure came with the holing of the ducky on clustered oyster shell when it negotiated Little Oyster Cove to pick up new crew and groceries. In the chandlers the only repair available was duct tape which did not hold against the air pressure in the inflated hull. Once on board and the bunk allocated, it was soon apparent that bunks have limited headroom and no external light, making a small dark world behind the privacy curtain. I sought the deck to engage in shipboard life, raked with the fears of new recruit nervous and ungainly in the extreme. 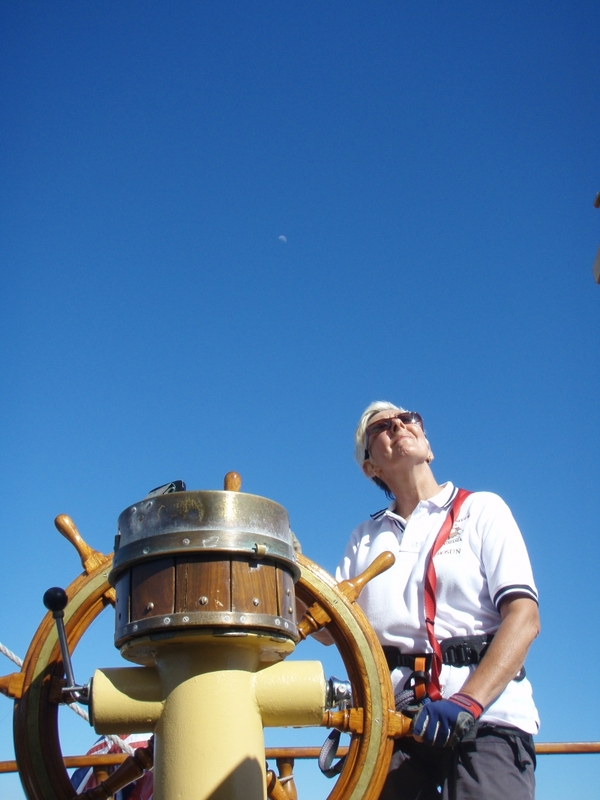 My mentors at different times: Jane, Barbara, John, Jan, Tina, Charles, were patience itself as I fumbled through setting, & handing sails, wearing ship and a new procedure of setting the spanker, and tacking. Orders were given and my mind would go never to remember the layout of lines diagram which I studied before embarking. 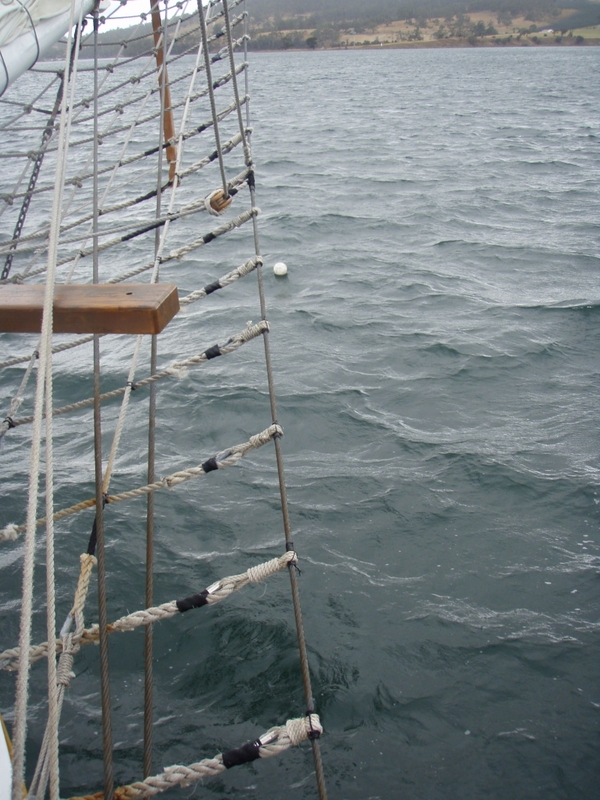 After three days I started to relax and to remember clews, bunt, sheet, halyard, tack, brace, and downhaul lines were attached to which sail and could place myself when they were deployed or handed at times without being guided. 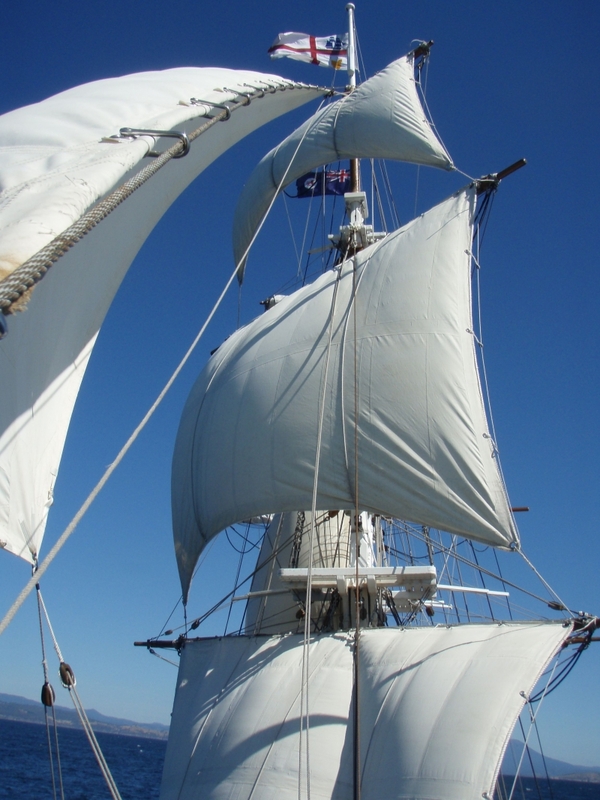 In addition there were orders from Master Mal Riley which had surprises for us all when the spanker was set, and staysails and jibs not used on harbour cruises had crew working hard on tacking manoeuvres with every sail on the ship deployed, often sequencing two or three. 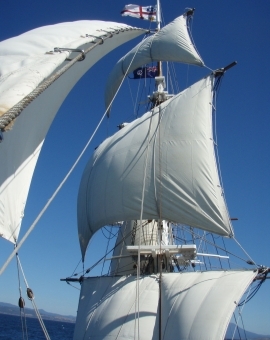 How wonderful the Lady looked under full sail from the deck. What a week? Sailing away into the unknown in more than a number of ways for me. 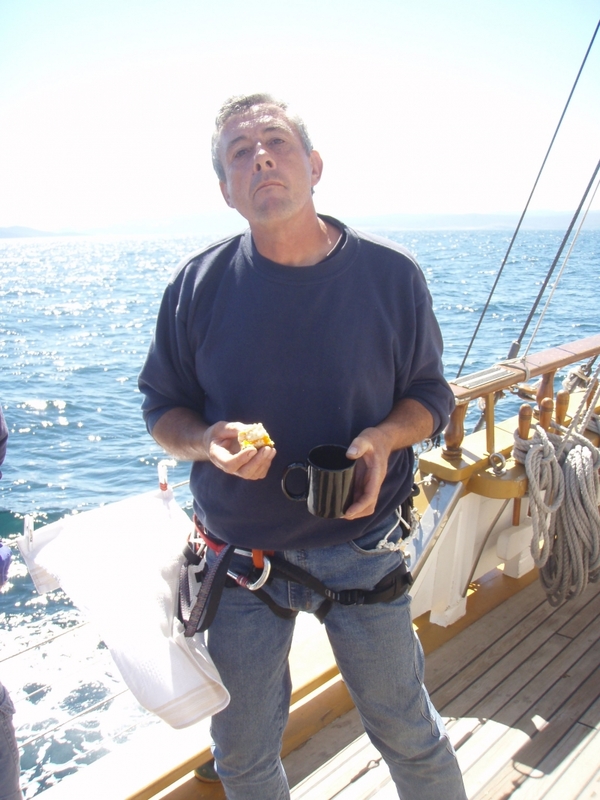 Like Joseph Conrad's famous book “Heart of Darkness” I was travelling on a journey into the unknown unsure of my abilities when placed under pressure as a ship's cook and a deckhand on a square rigger in the open sea. Over the course the week I proceeded to support the work of Mals's medium fishining stick... with minor success. 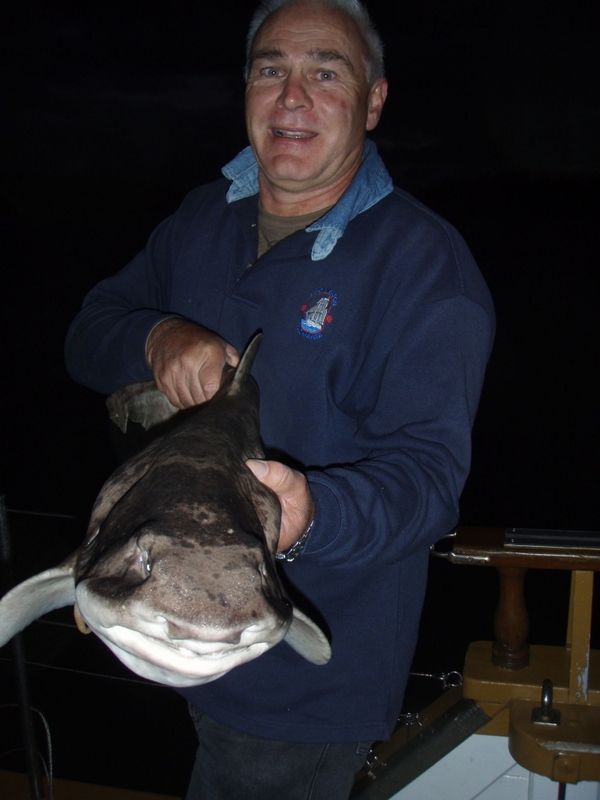 We caught a few fish, a squid or two and some small flathead. These went down well with the crew, after being prepared as snacks prior to our evening meals. 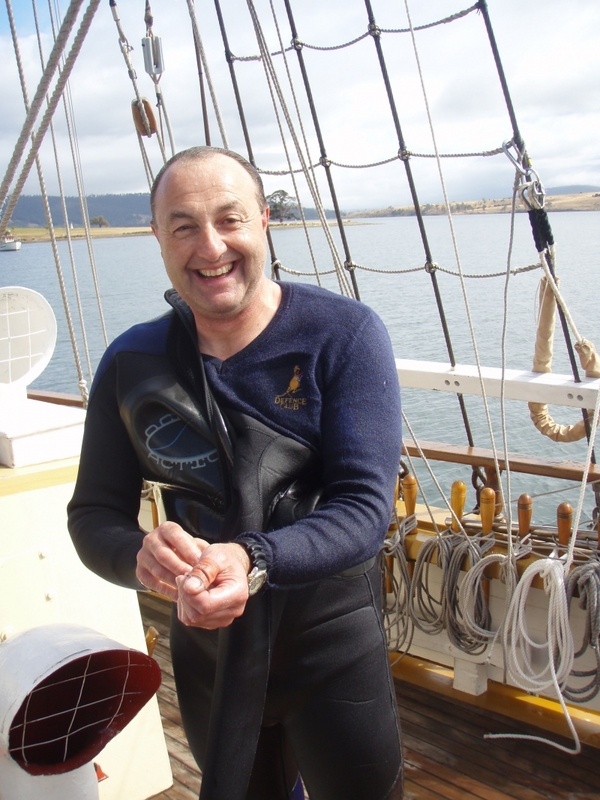 We were were even fortunate to dive and catch an abalone and blue mussels which were served on our final evening. Using th galley was a challenge but after a full on induction program from Lou and Steve prior to departure I was able to find my way supported by Meg and other shipmates throughout the week. For me it was a fantastic experience in so many ways, I challenged myself to go aloft and with support from John, Jan, Barb, Ed and others developed confidence in my ability to do this. With Jan's support I survived aloft in the beginnings of a thunderstorm. I had many high tides and a few low tides. My biggest low tide was failing my sullage pump test ie. leaving the pump unattended. 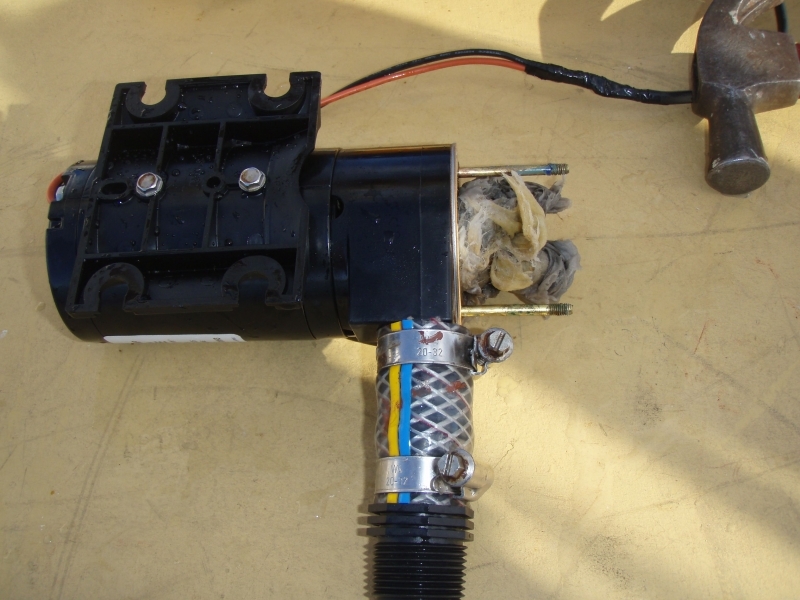 I learnt all about dismantling the pump and removing wet wipes from the impeller. Looks like I'm on the path of developing assistant engineering skills... with support from Tina and Charles. It was a fantastic week. I have learnt so much in so many ways. Thanks Mal. I hope that you have enjoyed reading about our voyage and sharing in our experiences. 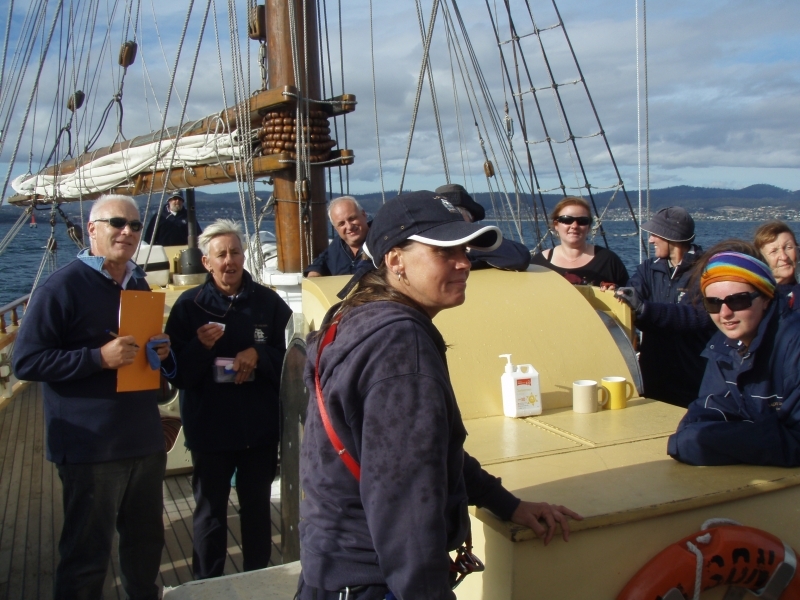 If you think that crewing aboard the STV Lady Nelson or otherwise contributing to the association sounds like fun, please visit our membership page or contact the office.